We’re heading into the final week of the 2018-19 regular season on the hardwood. 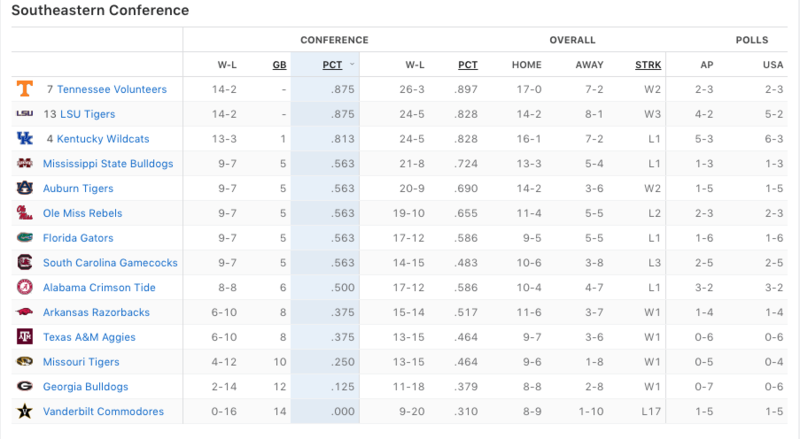 Entering Saturday, LSU, Tennessee and Kentucky were all tied atop the SEC standings at 13-2. The Tigers defeated Alabama 74-69 and the Volunteers got revenge against Kentucky 71-52, leaving us with a pair of 14-2 squads and UK in third place at 13-3. LSU is in the driver’s seat to win the regular-season title. The Tigers final two games are at Florida on Wednesday and against Vanderbilt next Saturday. Tennessee, meanwhile, hosts Mississippi State on Tuesday and travels to Auburn for its season finale. The Tigers won head-to-head against UT back on Feb. 23. Before the big dance, there is the SEC tournament in Nashville. The top four sees will get a double-bye and first play on Friday. 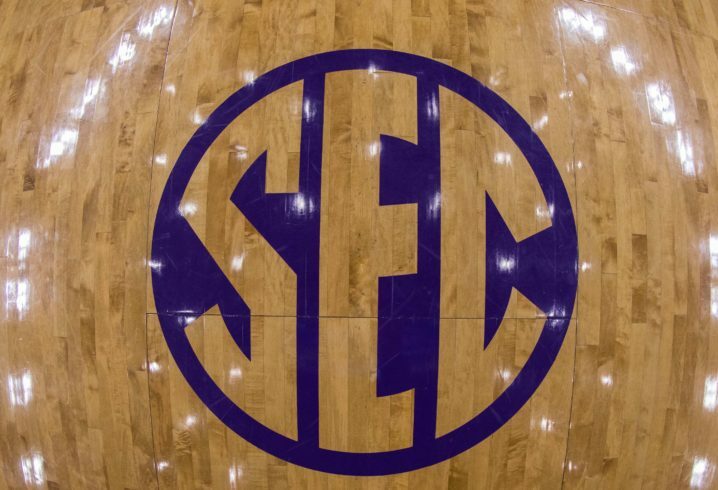 The top three seeds will obviously go to LSU, Tennessee and Kentucky. Who will get the fourth seed? That’s not clear at the moment. 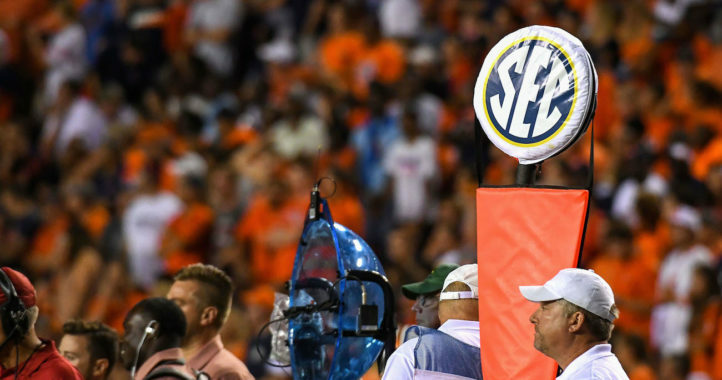 Five teams (Auburn, Florida, Mississippi State, Ole Miss and South Carolina) are in the hunt for that No. 4 seed, all 9-7 in conference play. Four teams entered the day 9-6 and lost, while Auburn got a key win over MSU 80-75. It will be interesting to see how it plays out in the final week of the regular season. 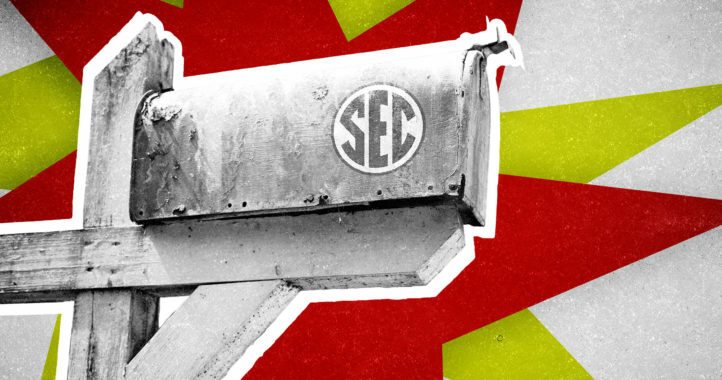 Does this site just cover ranked SEC bball teams? I guess that makes sense if clicks are the goal. If you care to write an article, Adam and crew might post it. I did confirm that “saturdaydownsouthbballunranked.org” is an open domain name. Why would I do someone’s job for free? What does some domain availability have to do with my comment? See the comment thread below for evidence that there was a lot of noteworthy bball outside of knoxville. If a football site is going to expand to men’s bball, it should do it properly. And unlike football, there are plenty of good and interesting unranked bball teams. Didn’t say you couldn’t make an arrangement-just agreeing with you that it’s an untapped market on here and a lot of the football guys don’t seem to like covering basketball. The domain name was a jest that you can create your own site to profit off this lack of coverage. I never said that basketball teams in the conf outside of UT weren’t interesting (Vandy is a great replacement for Comedy Central). Vandy would probably be a lot better if the cornerstone of their team, a likely lottery pick, wasn’t lost due to injury. I don’t see what’s so funny about an injured player. Every bball team regresses without their best player, but even without him I recall Vandy being interesting enough for a couple of close games against a certain in-state rival. Point to where I said player injuries were funny, pr1ck. Pretty amazing that all four 9-6 teams lost yesterday. I don’t think that changed much though. SC is not getting into the dance and the others still have an excellent shot to get there. It changed a whole lot. Florida is most likely out now with a loss to UGA. Auburn now has a chance to get the double bye if it can go 2-0 at bama and Tennessee at home. If we can get to 11-7 and USC loses one then we’ll most likely get the 4 spot. It didn’t change anything for the ncaa tournament. I suspect UF will still be in, but they aren’t a lock. Auburn has been in all year. This past weekend changed a lot for some teams..
Auburn is now a lock with their win. USC was never in and UF was never a lock. I don’t see a change there. Auburn was always in. Didn’t they say were but with their loss changed from bubble team to defintely not in. Florida’s loss changed their situation from probably in to win at least 1 more. Auburn’s win changed their situation from on the bubble to definitely in. Auburn is feast or famine. Fun to watch when Harper and Brown are dialed in, but when they’re cold – not so much. We’re def in the tourney, but if we continue to throw away big leads in the 2nd half, we’ll be out very quickly.